Microsoft has announced a major investment in UK data centres that will allow the software giant to offer its cloud computing service from Britain for the first time. The company plans to build two centres in the UK next year, its chief executive Satya Nadella announced at the Future Decoded conference hosted by Microsoft on Tuesday. The investment, worth hundreds of millions of pounds, will allow the businesses and government bodies that use Microsoft’s online computing services, Azure and Office 365, to ensure data about customers and citizens is kept in the UK. Previously, businesses would have applications powered by data centres in Ireland or the Netherlands. Microsoft’s move comes amid growing international scrutiny of data practices and the European Court of Justice’s recent decision to invalidate “Safe Harbour”, a transatlantic treaty that had allowed the unfettered transfer of personal data from the EU to the US. Microsoft, Amazon and Google are directly competing around the world to sell on-demand cloud services, which allow businesses to outsource functions such as data storage and IT software without upfront hardware costs. The market is estimated to be worth £3.4bn in the UK alone and growing rapidly. Amazon announced last week that it planned to build data centres for its cloud computing business in the UK. Liam Maxwell, the Government’s chief technology officer, said the two companies were investing $3bn (£2bn) between them. Microsoft has invested more than $2bn in cloud infrastructure across Europe. Mr Maxwell said the Government spends more than £1bn on data centre hosting because data protection rules force it to keep some personal data in the country, and that Microsoft and Amazon building UK data centres would help it save “a lot of money” by outsourcing operations. Scott Guthrie, the head of Microsoft’s cloud and enterprise division, said the decision to open data centres in the UK was not a response to the Safe Harbour treaty being scrapped, but that “data residency” is an increasingly important issue. He said one data centre was likely to be built near London, with another on the other side of the country, and that Microsoft now has data centres in twice as many territories as Amazon and Google combined. With less than a week to go until the speculated November 10 release day for Windows 10 (codename) Threshold 2, Microsoft has released build 10586 to participants in the Windows Insider Program. 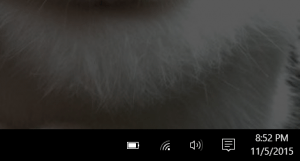 I updated my Dell Venue 8 Pro and noticed that there isn’t a build number displayed in the lower right corner of the desktop as there was for previous preview builds. 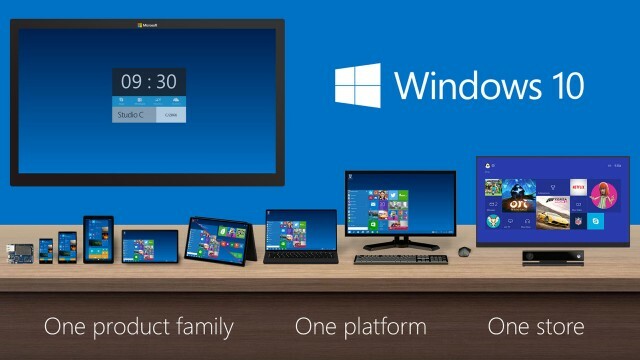 It looks like build 10586 may be released as what will be officially called the Windows 10 Fall Update. 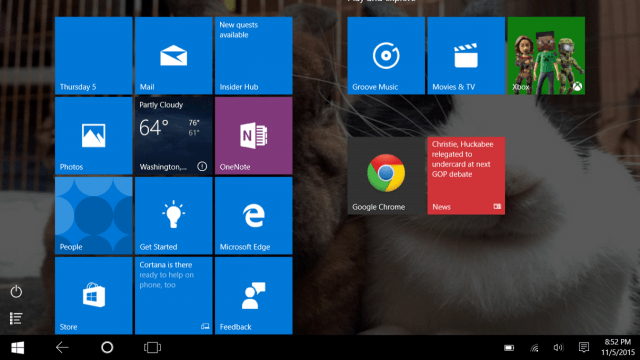 This will be the first major update since Windows 10 launched on July 29. Text Input Panel improvements, including not having it automatically open when in Desktop mode (versus Tablet mode). Device Activation began accepting activation keys from Windows 7, 8, or 8.1. The Xbox beta app also gained the ability record voiceovers using the Game DVR. The random flashing of a disksnapshot.exe command prompt was fixed. I saw this for the last time during the upgrade to build 10586! Apps and games should download from the Store more reliably. This remains to be seen. I did not see any Windows Store App updates available immediately after upgrading. 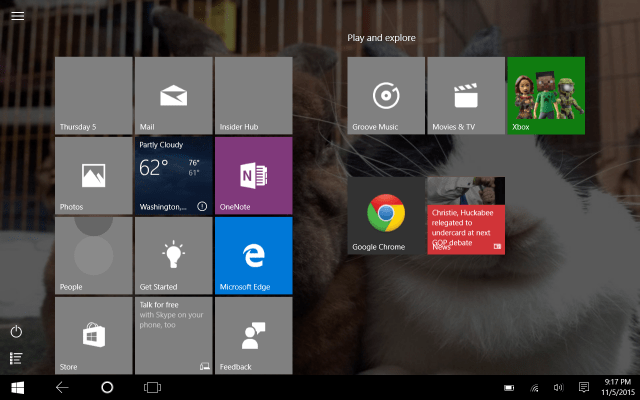 The only oddity I’ve noticed in the short time I’ve have to test build 10586 is that after switching from Tablet mode to Desktop mode and then back again, all the Start Menu tiles that had a blue background changed to a light gray background. However, that doesn’t seem like a showstopper bug, and it wouldn’t be surprising to see this build released shortly as the Fall Update. Microsoft has been making the first-party Surface Windows tablets for a few years, and they’ve actually won a lot of fans. Now the company is trying its hand at a more traditional laptop form factor with the Surface Book. Well, it’s not very traditional when you look at thatwacky flexing hinge, but it actually looks like a laptop, and it’s packed full of high-end hardware. In fact, it’s packed so tightly that it’s almost impossible to open and repair anything yourself. The teardown experts at iFixit have dug into the Surface Book and given it the lowest possible score for repairability. Microsoft plans to hand over the reins of Microsoft Office to longtime executiveJulie Larson-Green, according to sources familiar with the company’s plans. Kirk Koenigsbauer, the corporate VP who had been leading the company’s Office efforts, will shift to a role within the unit headed by chief marketing officer Chris Capossela, the sources said. The move comes at a critical time for Office, long one of Microsoft’s two biggest money-makers, along with Windows. Microsoft is in the process of shifting Office from a piece of software that companies and individuals purchase and upgrade over time to one that is licensed via an annual subscription. The company has also been trying to grow Office, both in terms of the number of apps that are part of the suite, and by bringing Office to new places, such as iOS and Android. Microsoft has also moved to make mobile Office apps free for devices with a 10.1-inch or smaller display. Not all that work has been done in-house — the company spent $200 million to acquire Acompli, which became Outlook for the iPhone and Android, and has since acquired Sunrise and Wunderlist. Larson-Green, who has been serving as chief experience officer for Microsoft’s services group, will keep those duties and add responsibility for the teams that develop mainstays like Word, Excel and PowerPoint, as well as newer apps such as Sway. In her more than 20 years at Microsoft, Larson-Green has had a number of prominent roles, including being the first woman to run the Windows engineering team, as well as a brief stint running Microsoft’s devices unit. Prior to working in Windows, Larson-Green was a top executive in the Office unit. The Fifth Avenue Apple store has a new neighbor. Microsoft today opened its first Manhattan flagship store at Fifth Avenue and 53rd Street. The Microsoft Flagship Store celebrated its grand opening with a ribbon cutting ceremony, and PCMag’s Sascha Segan was on hand to check out the five-floor, 22,000-square-foot store. Whether you’re eyeing a new Surface tablet, Lumia smartphone, or Microsoft Band fitness tracker, the company’s latest hardware is on display, as are Signature Edition PCs, the Xbox One, Office software, and a variety of accessories. The first 1,000 people in line today received complimentary tickets to Redmond’s community concert featuring Pitbull, which kicks off at 8 p.m. tonight in Rockefeller Center. Gamers, however, are invited to 677 Fifth Ave. at 9 p.m. tonight ahead of the midnight launch of Halo 5: Guardians. The celebration offers access to early gameplay, giveaways, food, and more. Attendees can also win a trip for two to Seattle for a tour of Xbox and 343 Industries—creators of the Halo franchise. Since opening its first brick-and-mortar shop six years ago, Microsoft has expanded its retail presence with more than 110 stores across the U.S., Puerto Rico, and Canada. But this is its first massive flagship store. “One of our goals, since we started the stores in 2009, was to have a real marquee location where we could bring an expanded retail presence,” Kelly Soligon, general manager of Worldwide Marketing for Microsoft Retail and Online Stores, said in a statement. On the third floor of Microsoft’s new Fifth Avenue location, visitors will find The Dell Experience, which showcases the full range of Dell products, from the XPS, Inspiron, and Precision computers to Alienware gaming products. There’s also an answer desk for technical questions, troubleshooting, and repairs (team members speak a total of 19 languages); a community theater for training sessions and hosting in-store events; high-definition video walls that stream videos, images, and information; and the culture wall to display noncommercial, artistic images. Redmond will also give more than $3 million in grants to 14 nonprofit organizations in each of the city’s five boroughs. Recipients include All Star Code, Brooklyn Academy of Music, Brooklyn Children’s Museum, Directions for Our Youth, National September 11 Memorial & Museum, Network for Teaching Entrepreneurship, New York Botanical Garden, New York Hall of Science, Per Scholas, PowerMyLearning, Staten Island Children’s Museum, Staten Island MakerSpace, We Connect the Dots, and Women’s Housing Economic Development Corp.
Microsoft has struggled to make Windows Phone a viable competitorin the mobile ecosystem for more than five years now. There have been some good devices running Windows Phone, but the lack of apps has been a constant pain point that has limited adoption. On the cusp of Windows 10 coming to smartphones, Microsoft is dealing with a new problem, and it might be entirely their own doing. 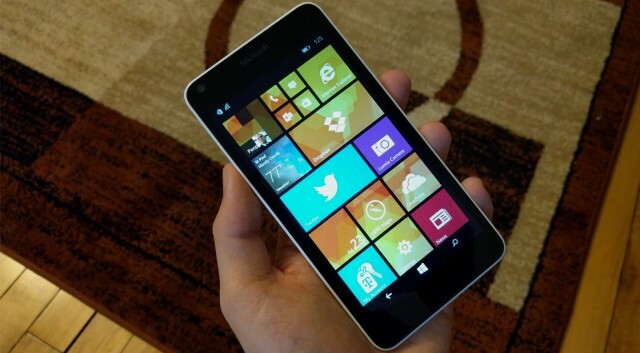 Developers that have previously been maintaining Windows Phone apps are losing interest, and in some cases dropping support altogether. Costing $200 more than the most basic Surface laptop, this model features an Nvidia GeForce graphics chip rather than relying on graphics tech built into the main processor.